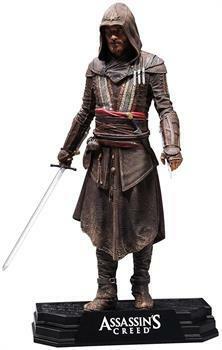 From the upcoming Assassin's Creed movie comes Aguilar as a new McFarlane Color Tops action figure! This 7-inch figure includes multiple points of articulation. Aguilar is featured in his iconic assassin robes and sculpted using 3D scans of the actor, Michael Fassbender. The figure comes armed with an assassin sword, extended Hidden Blade and stylized display base with brand specific callout. This figure is Color Tops Blue Wave #12. Officially licensed. Collect them all! From the upcoming Assassin's Creed movie comes Aguilar as a new McFarlane Color Tops action figure! Aguilar is featured in his iconic assassin robes and sculpted using 3D scans of the actor, Michael Fassbender. Figure comes armed with an assassin sword, extended Hidden Blade and stylized display base with brand specific callout. This figure is Color Tops Blue Wave #12.